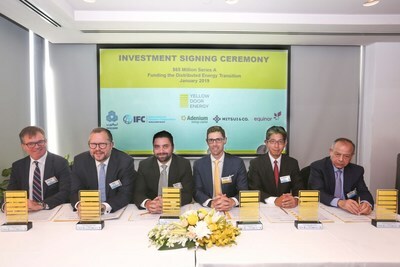 The investment comes from International Finance Corporation (IFC), a World Bank member, Mitsui & Co., Ltd. (Mitsui), Equinor Energy Ventures (Equinor), Arab Petroleum Investments Corporation (APICORP), and UAE-based Adenium Energy Capital (Adenium), the founding investor of Yellow Door Energy since 2015. Jeremy Crane, CEO and Co-Founder of Yellow Door Energy, commented: "The funding validates our company's vision of powering emerging economies reliably, efficiently and sustainably. It enables us to scale our energy platform from the Middle East to Africa and Asia. We aim to build 300 megawatts of solar in the next 2 years, benefitting hundreds of businesses and the broader economy. We are excited that prestigious global investors believe in our company's credibility, commitment and customer-centric offerings." Erik Becker, IFC Manager of Infrastructure and Natural Resources in the Middle East and Africa, commented: "Lack of economic power supply is hurting businesses large and small, stifling economic growth and contributing to unemployment across the region. Yellow Door Energy's business model will help companies reduce energy costs and lower their carbon emissions - a strategic objective of IFC in the region." Akihiro Shirane, General Manager of Third Department, Second Projects Development Division of Mitsui, commented: "Mitsui has been active and highly committed to developing infrastructure projects in the Middle East for decades, and we see the market shifting towards renewable energy for further sustainable growth in the region. This is an exciting milestone for Mitsui to enter into the distributed solar sector in the Middle East, and we strongly believe through its innovative business model and reliable solution, Yellow Door Energy will contribute to a clean, sustainable future in the region." Gareth Burns, Equinor's Vice President and Managing Director, commented: "Our investment in Yellow Door Energy secures an early entry in the company driving the growth of distributed solar in Middle East and Africa. Together with our co-investors, we look forward to supporting Yellow Door Energy in achieving their ambitious growth plans." Bennie Burger, Managing Director of Investments at APICORP, commented: "Renewables is one of the priority focus areas for APICORP and we believe that solar energy projects such as these will be at the forefront of efforts to meet rising power demand in the MENA region and beyond. APICORP will continue to finance projects in the renewables space, encouraging private investments in the sector and facilitating the growth of the nascent sector. By pioneering innovative financing models, we ultimately aim to support the development of the renewable energy sector, particularly in a region with such a large market potential." Wassef Sawaf, CEO of Adenium and Chairman of Yellow Door Energy, commented: "We are thrilled that the company we established with Jeremy Crane in 2015 continues to expand and attract a new pool of investors. We strongly believe in its future growth, which is why we are making further investments alongside the other Series A investors, as we continue to support the C&I space in solar. With the support of Adenium and the other Series A investors, Yellow Door Energy is now well positioned to grow exponentially over the coming years."